A 10-year-old female spayed Domestic Shorthair named Penelope presented to Hinsdale Animal Hospital for evaluation after the owners noticed a small bump on her face. The mass had slowly gotten larger over the course of a few weeks. A fine needle aspirate (FNA) and cytology was performed by Dr. Plomin and sent into the laboratory. Results confirmed feline cutaneous mast cell tumor. A mast cell tumor (MCT) is caused by the over-proliferation of neoplastic mast cells. Mast cells are normally found in the skin and many other tissues such as lymph nodes as part of the immune system. 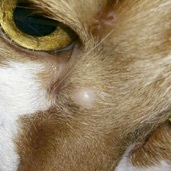 The most common sites for MCT in the cat are the skin, subcutaneous tissues, and the spleen. In order to assess severity of disease, bloodwork and an abdominal ultrasound was performed on Penelope. Thankfully, no signs of visceral MCT was present and she was diagnosed with cutaneous localized disease. Surgery was performed to remove the mass and clean surgical margins were achieved giving Penelope a good prognosis and small chance of recurrence. This case illustrates the importance diagnostics when it comes to cutaneous skin masses. When a patient presents with a skin or subcutaneous mass, it is impossible to eliminate the chance of a patient having a mast cell tumor based on palpation and appearance alone. They can be haired or hairless, ulcerated or smooth, singular or in groups and are frequently known as “the great imitators” because of it. By bringing your cat in for yearly examinations by your veterinarian these masses can be identified and removed early, allowing a successful outcome and a long life for your furry friend.